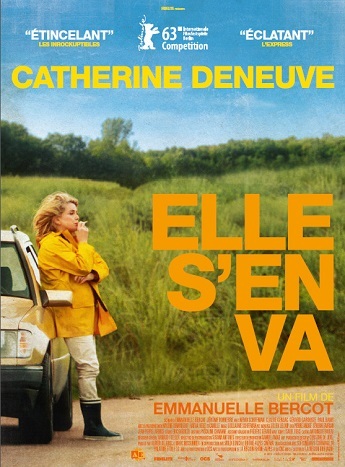 French movie icon Catherine Deneuve gets behind the wheel in Elle S’en Va, a road movie a la française by actor-director Emmanuelle Bercot, which starts out in classic fashion as a journey offering a new perspective on everyday life before sharply changing course. Bettie (Deneuve) is a sixty-something restaurant owner living with her mother in a sleepy town in Brittany. Her life revolves around taking orders and serving clients until she learns she has been dumped by her lover for a much younger woman. In the middle of a lunchtime sitting, she leaves the restaurant, gets into her car and starts to drive. Cue a range of encounters with characters way out of Bettie’s comfort zone. A call from her estranged daughter Muriel, played by French folk-singer Camille, brings Bettie back down to earth. She is asked to take her grandson Charly to stay with his paternal grandfather for the summer vacation. Charly, played by Bercot’s real life son, Nemo Schiffer, forces Bettie out of her introspective mood and the movie kicks into a new register. With this relationship Bercot returns to familiar territory, exploring the conflicts between adults and children but has nothing new apart from saying that adults and children have a lot to learn from each other.